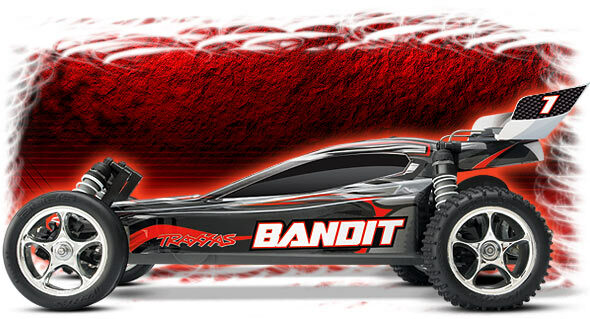 Traxxas Bandit: 1/10 Scale Off-Road Buggy, Fully-Assembled, Waterproof, Ready-To-Race, with TQ 2.4GHz Radio System, XL-5 Electronic Speed Control, and ProGraphix Painted Body. The Bandit is fully loaded with engineered performance features such as the advanced Revo-Spec Torque-Control slipper clutch. 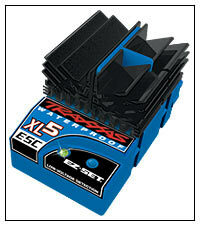 The patent-pending design allows precise adjustment and delivers smooth, consistent traction control. The durable, fiber-composite chassis is designed for exceptional rigidity, and offers an inline battery position for a low polar moment of inertia. That’s engineering speak that translates into nimble handling and lightening-fast response. 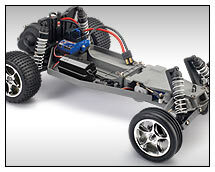 The low-profile « lay-down » steering servo mounting system further enhances the Bandit’s already low CG design. 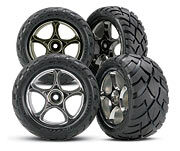 Bandit offers superior stability and cornering thanks to its centered kingpin and live axle front suspension. Transmitting the power to the wheels is an efficient 3-gear variable-ratio transmission, topped off with sealed ball bearings and smooth-running telescoping driveshafts. 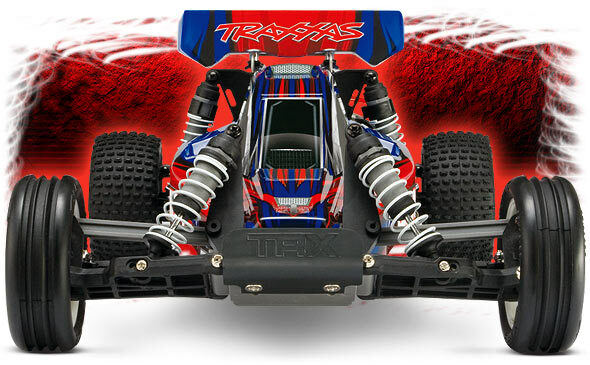 In addition to those advanced features, the factory-installed planetary differential is Traxxas-Tough™ with hardened steel gears that never need adjusting! Perfect for long-lasting, all-day fun. Only Traxxas could put this kind of performance, innovation, and overall value into a Ready-To-Race®package that delivers the satisfaction you expect from a high-performance electric buggy. Speed, ruggedness, and stunning looks elevate Bandit far above the ordinary. 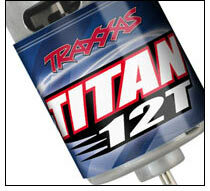 Traxxas’ forward thinking and « no-nonsense » approach brings you the most performance for your R/C investment. Bandit is more than just fun to drive. 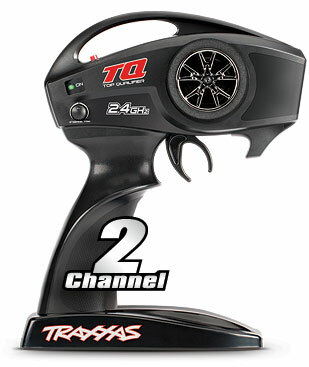 It’s easy to own, too, with legendary durability, low-maintenance design, and unmatched parts support and one-on-one service from either Traxxas or a network of thousands of hobby stores worldwide. 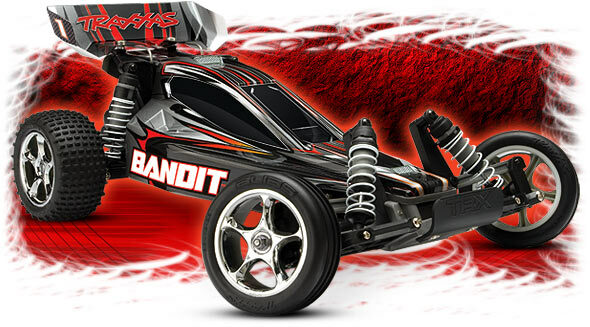 On and off the road, at the track or in your backyard, the new Bandit is the ultimate Extreme Sports Buggy™ made for the driver who wants to experience max speed and all-out buggy fun.